Michael Palm Toft scored 11 points for Panthers. Not only did he make the grandest of East of England Showground entrances by going through the card with a 12-point haul as Newcastle Diamonds were seen off 51-41, Barker’s brilliant display was all the more impressive considering it was also his return to racing after more than two months out with a broken back. He began with a bang by storming round the outside of Tero Aarnio to triumph in heat four and followed up powering to the flag in heat seven. He passed his toughest of the night with flying colours in heat 11 by blazing around fellow unbeaten rider Steve Worrall before completing his full house by leading home guest number one Nicklas Porsing for a gift-wrapped 5-1 in heat 13 after Worrall had demolished the tapes. Barker was excused from the traditional maximum celebration of the bumps due to his recent back trouble, but a standing ovation from hundreds of new fans more than made up for that on a night when Panthers all but ensured their place in the play-offs. “It was a dream start for me,” said Barker. “To get a maximum in my first meeting for a new club – and in my first meeting back from a long injury lay-off – is fantastic. “I said beforehand I wanted to win my first ride and I would have been happy just to do that, but to follow it with three more wins was really pleasing. “The management told me to go out and enjoy being back on a bike and that’s what I tried to do. There is still plenty to work on – especially my starting, which was a bit rusty – but it is a great way to get going again. But this was no one-man show as Barker received excellent support from his team-mates – two of whom (the exciting Emil Grondal and the back-on-song Michael Palm Toft) also reached double-figures. Grondal recovered from an errant second ride to be paid for a dozen points – a haul which included arguably the finest individual contribution of all. The World Under 21 finalist produced a brilliant solo display to thwart the tactical ride of Diamonds guest Matej Kus in an 11th heat eventually completed at the third attempt. Guest Nicklas Porsing had gone into the tapes in the initial staging to earn an exclusion (even though Panthers were adamant his bike did not make contact with them) before his replacement Rafal Konopka crashed out of the re-run. Konopka was none the worse for a high-speed spill on a night when he and returning reserve partner Simon Lambert were paid for a combined 15 points. Stand-in skipper Lambert returned from a month out with a broken shoulder blade in style by leading home Konopka for a gift-wrapped 5-1 in heat two. Newcastle reserve Aarnio was left motionless at the start as he claimed the green light had failed to function while partner Simon Nielsen raced off a 15-metre handicap due to a starting offence. 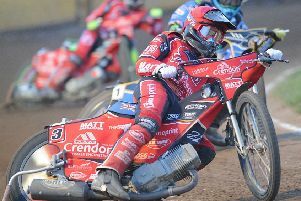 Aarnio later redeemed himself with some determined efforts which included a heat 14 triumph to ensure the visitors still had hopes of snatching a consolation point with a maximum in the finale. But Panthers’ chosen pair of Porsing and Grondal packed the minor places behind Kus to ensure that didn’t happen. Team boss Carl Johnson – in sole charge with Dale Allitt on duty with King’s Lynn Young Stars – said: “A performance like that was a great way to end the week. “I’m really impressed with the way the boys went about it in what could have been a really tough meeting. “The spirit has been brilliant all season and that was the case again. We want riders who want to ride for Peterborough Speedway and that definitely applies to Ben. “He is a pure racer and a quality rider. To reel off four wins in the manner he did against top opposition is incredible. The win lifted Panthers into third in the Premier League standings – six points off the top two spot they crave. They return to action with two away tests against two sets of fellow play-off chasers in the space of 24 hours next week. Panthers visit sixth-placed Ipswich on Thursday (August 27) and then head to fifth-placed Somerset the following night. PANTHERS: Ben Barker 12 (max), Michael Palm Toft 11, Emil Grondal 10+2, Nicklas Porsing (guest) 7+1 , Simon Lambert 6+2, Rafal Konopka 5+2, Rider replacement for Lewis Blackbird. NEWCASTLE: Matej Kus (guest) 15, Tero Aarnio 9+1, Steve Worrall 8, Anton Rosen 4+1, Simon Nielsen 3, Ludvig Lindgren 2, Rider replacement for Christian Henry.